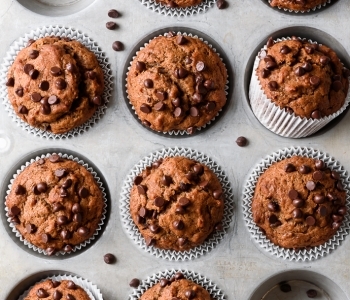 Do you prefer sweet or savory breakfasts? I’m decidedly on team sweet, which most of the time means a swirl of raspberry jam atop almond butter toast, a drizzle of amber maple syrup in steamy oatmeal, or, more often than not, thick and creamy Greek yogurt topped with seasonal fresh fruit or berries. Love that sweet start (…and end… and middle) to my day. 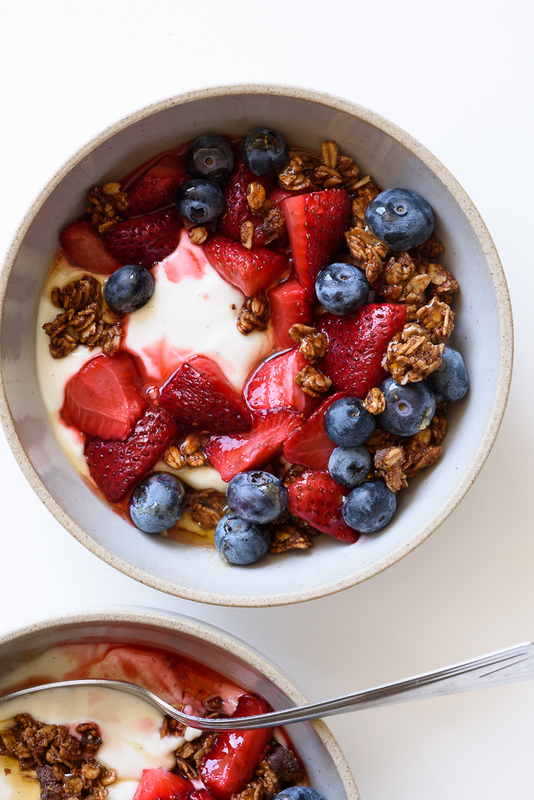 These roasted strawberry yogurt bowls take that plain ol’ everyday yogurt with fruit to a whole new deliciously indulgent level, and have quickly become a new favorite. I’ve been legitimately excited to wake up to this heavenly combination, probably because, despite being naturally-sweetened and full of mostly healthy, wholesome ingredients, these creamy, berry-swirled, granola-studded bowls taste like I’m getting away with something: dessert for breakfast. Admittedly, this seems a little high-maintenance for breakfast – and there is some planning that goes into making both the roasted strawberries and the chocolate-coconut granola – but it’s almost entirely hands-off time, and can be easily (and preferably) done in advance. I like to prep both components over the weekend, so they’re on hand for easy assembly on busy weekday mornings. Roasting strawberries, as with all roasted fruit, caramelizes and concentrates their natural flavor and sweetness, rendering them soft and syrupy, and delightful atop just about anything creamy (yogurt, ice cream, cheesecake…). The process is crazy-simple: chop into halves/quarters, depending on size, arrange on a baking sheet, drizzle with a few teaspoons of good maple syrup as needed, and roast until saucy and fragrant. The chocolate-coconut granola is a chocolate-y update to my very favorite, crispy and perfectly clumpy, naturally-sweetened, homemade granola. I shared it with you last Summer, and it’s nearly foolproof, highly-adaptable, and packed with delicious – and wholesome – ingredients. The only change I’ve made here is the addition of unsweetened cocoa powder, which adds chocolate-y depth and is a lovely accent to the roasted strawberries. 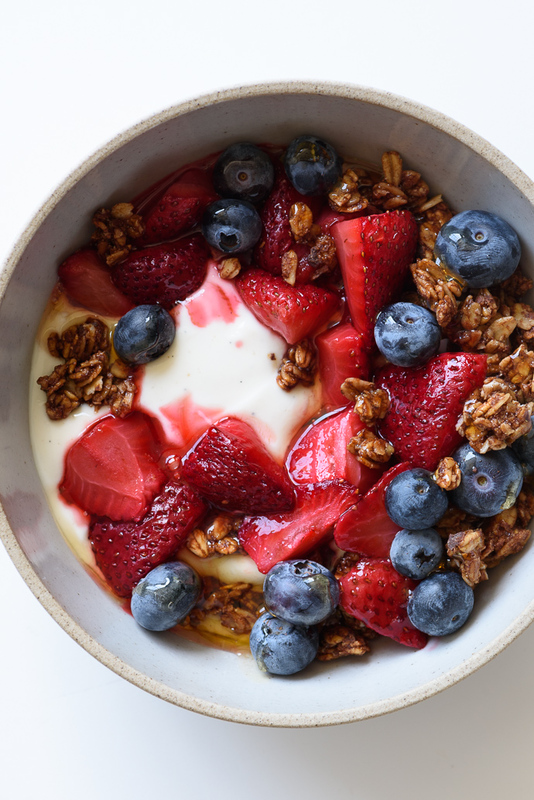 So, once the strawberries and granola are at the ready, come Monday morning, it’s as easy as spooning your favorite yogurt into a bowl, topping with the nectarous roasted strawberries, crispy clumps of chocolate granola, a handful of fresh blueberries if you’ve got ‘em, maybe a little extra drizzle of maple syrup, and diving into breakfast (or dessert!). 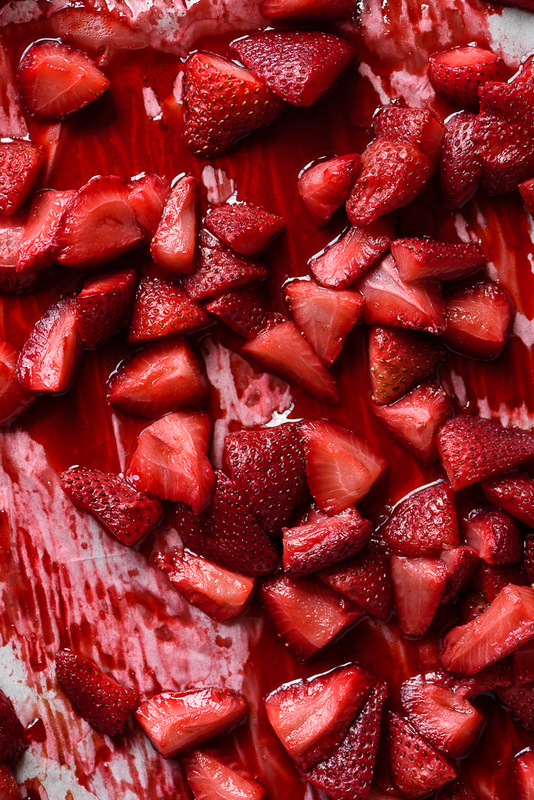 Preheat the oven to 375 degrees F. Arrange the strawberries in an even layer on a parchment paper-lined rimmed sheet pan. Drizzle lightly with the maple syrup, if using. 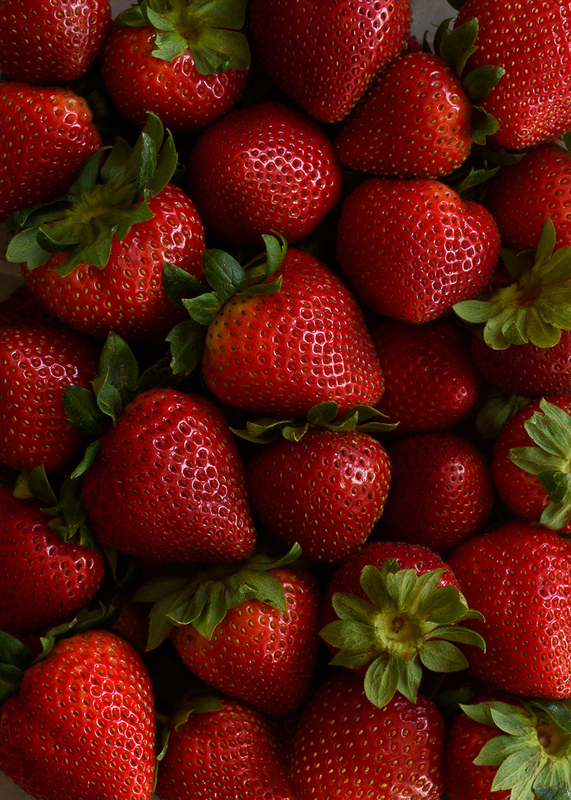 Roast until the strawberries are soft and fragrant, about 15 minutes. Let cool for 10 minutes on the pan, then transfer to a bowl (including juices) and let cool to room-temperature. 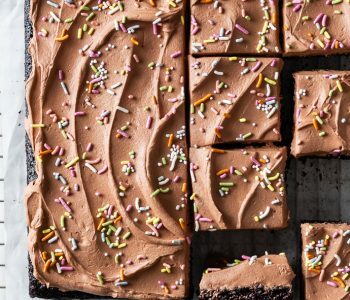 Preheat the oven to 325 degrees F. Line a 9×13-inch rimmed sheet pan with parchment paper. Set aside. In a large mixing bowl, combine the oats, coconut, cocoa powder, cinnamon and salt. In a separate small mixing bowl or glass measuring cup (I use this Pyrex one), whisk together the melted coconut oil, maple syrup and vanilla until combined. Drizzle over the dry ingredients, and use a spatula to stir the granola together until evenly moistened. Stir in the chocolate chunks, if using. Spread the granola into the sheet pan, and use the back of the spatula to gently press into an even layer. Bake for 35-45 minutes until golden brown. Remove from the oven and let cool to room temperature in the pan. When the granola is completely cooled and crispy, use your fingers to break it into chunks. Store in an airtight container for up to a week. 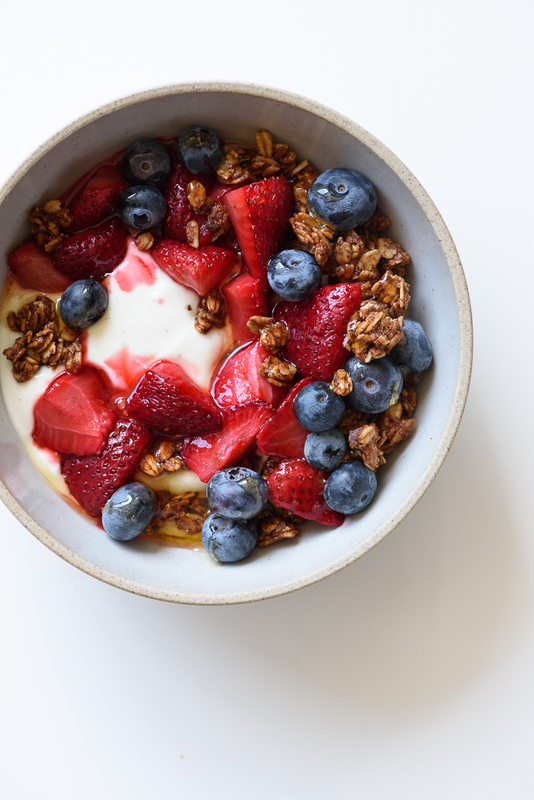 Divide the yogurt between bowls, top with the roasted strawberries, a sprinkling of granola, and fresh blueberries or maple syrup, to taste. Enjoy!! What a way to greet the morning! Yum! these bowls are gorgeous! I, too, lean on the sweeter side of breakfasts (and snacks), and my go-to breakfast is definitely greek yogurt bowls topped with fresh fruit. 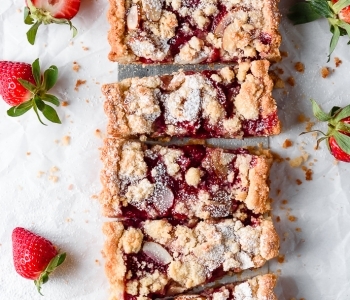 right now, I’m totally digging strawberries, so this recipe is perfect. I can’t get over how beautiful and enticing these bowls are! I would give almost anything to have one magically appear tomorrow morning. Going to try this for sure. 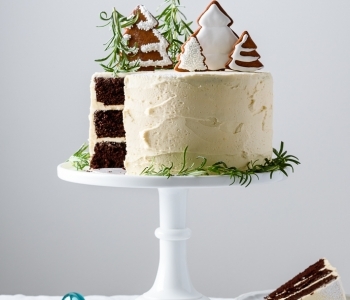 I’m straight down the middle between a love of sweet and salty for breakfast! Recently it’s been sweet though! 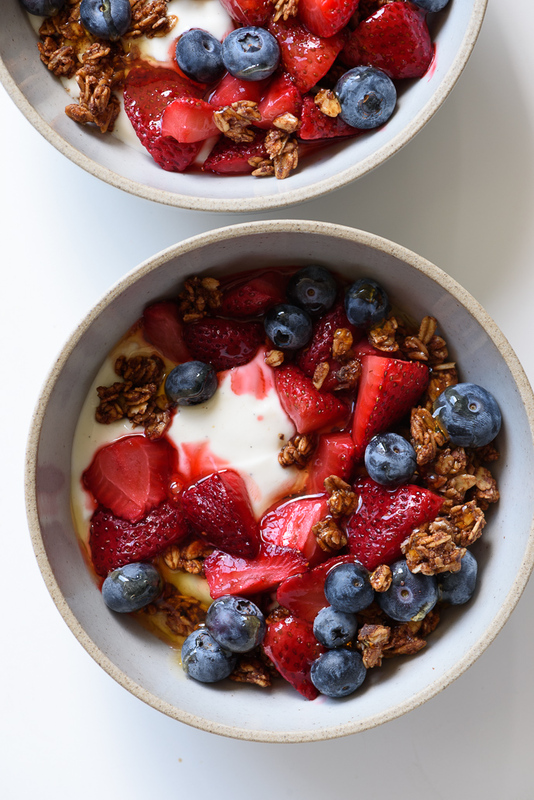 And these yogurt bowls sound SO amazing!! Love this!